I'd normally start a write up with a little prelude to how the night went but after last night's rain and driving conditions I'd say I'm lucky to be alive. Okay, maybe a slight over exaggeration but it was wet. And more wet than normal for Wales (if that was ever possible). Having done 50mph for the full length of the motorway I finally found myself in the dry warmth once more as the small gathering of fans patiently awaited the arrival of the band on stage. For a group so young and fresh in the game you'd expect their sound to imitate its youthful appearance yet what's presented is an incredibly different aesthetic. From the soaring vocal abilities from frontman Ben Gregory, right through to their brash and cathartic percussion and metallic basslines, Blaenavon have mastered their perfectly detached art form in wonderful style. In a live setting it's all but the same yet amplified on a much grander scale. Working their way through a setlist made up predominantly of new tracks from their forthcoming as yet unannounced debut album, it looks likely things aren't about to get toned down any time soon. From the thunderous clash of drums comes a commandeering approach to their songwriting and as the band rattle around on-stage the distinct romanticism cast amongst their songs becomes all the more apparent. "You might know this one" exclaimed Gregory as they launched in to Prague. With its beautifully placed switch ups and splintering guitars comes an enticing and spellbinding infusion of post-rock indie, deafening to the ears but leaving a keenness for more. 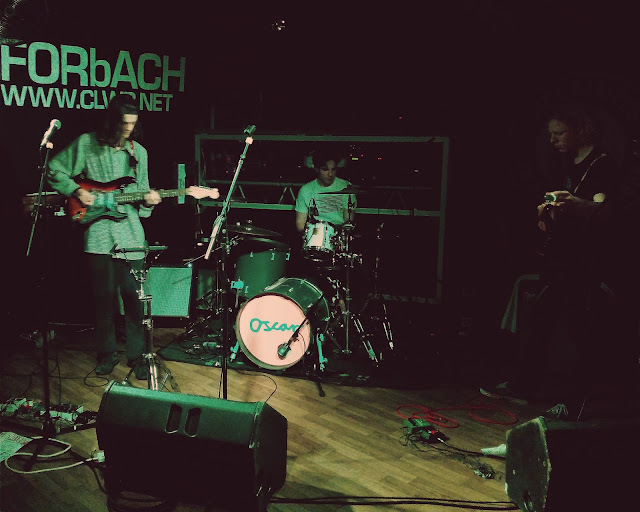 Rounding up on another new track entitled Take Care, its resounding kick drum hits and energetic kaleidoscopic sounds showcase how much more that's still to come from the promising Hampshire trio. Whilst their set was short its powerful delivery was more than enough to make a lasting mark.